We can despatch this pre-order title to you in advance of the official release date of 1st May. 12 tracks: The Waves Bear The Saints * On Clouds Over Mull * The Great Michael * Forth Bridges * The Vikings Sing Their Tribute * Built On The Clyde * You Are Far Away * Miner * Miner’s Hymn * Cutty Sark * Corvette Returning * Silver Darlings. 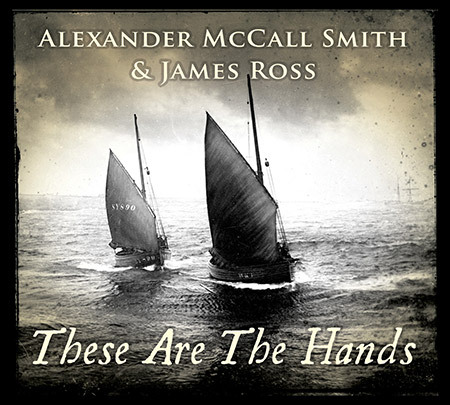 An album of new songs and music with words by Alexander McCall Smith and music composed by James Ross. These Are The Hands explores Scotland’s relationship with the sea and the land, including themes such as immigration, emigration, ship building, fishing and mining. James plays piano and Alexander narrates. The music and the songs celebrate the presence of the sea in Scottish life, past and present. The sea has to a great extent defined the Scottish character: nowhere in Scotland is far from the coast; the sea gives us our weather, our skies, and, even today, an important part of our livelihood. Influenced by Scottish traditional music, the new compositions convey a sense of just how the sea has made its mark on the people of Scotland. A number of the songs look back at Scotland’s previous maritime experience. These include earlier times – the sea crossings of early saints and the sea roving of Vikings. Others have a more recent setting – as in the case of Shetland whalers and the young crew of a corvette on North Atlantic duty in the Second World War. The historical circumstances may vary, but the nature of the sea itself, its pull, its warnings, its perils have been the same throughout the ages. The music and lyrics also explore the relationship that people have had with the land. Alexander and James explore the story of the Scottish coal miner and depict the hardship of pit work through song and instrumental music. Alexander McCall Smith is one of the world’s most popular and prolific authors whose novels have been translated into forty-six languages. He is the author of the highly successful The No.1 Ladies’ Detective Agency series which has now sold over twenty million copies in the English language alone. In recent years, he has collaborated with a number of Scottish composers, writing song cycles and opera libretti. He is a keen sailor. James Ross is earning a growing reputation as a composer of music that pushes the boundaries of Scottish traditional music. James released his debut piano album on the Greentrax label. His second recording, Chasing the Sun, was a co-commission by Celtic Connections and The Blas Festival. Recent projects have included The Boy and the Bunnet, a words-and-music piece for children and a soundtrack for Theatre Workshop Scotland’s film The Happy Lands. The songs are performed by singers Michelle Burke and Kathleen MacInnes. Michelle Burke was lead singer with Irish-American traditional music group, Cherish The Ladies. She is an impressive interpreter of songs with a timelessly expressive, exquisitely nuanced voice. The gorgeous, peat smoked tone of Kathleen MacInnes’ Gaelic singing has earned the South Uist native international acclaim. She has been part of Transatlantic Sessions and featured in Ridley Scott’s film Robin Hood. A host of session musicians fill out the sound in this very fine album of songs and music: Su-a-Lee (cello, musical saw), Patsy Reid (fiddle, viola), Leo Forde (guitar), Angus Lyon (accordion), Ryan Quigley (trumpet), Euan Burton (double bass), Liam Bradley (percussion), Mikey Owers (brass), Ryan Young (fiddle) and John Kenny (trombone). The album was engineered and produced by legendary producer Calum Malcolm.